Finally today several years after, I guess I found some "Easter Eggs". This time in terms of Google. Today Google is celebrating "Yuri Gagarin" - who on 12 April 1961 became the first person in space and the first person to orbit the Earth. I don know if I can call them as Easter Egg but still I would go about doing so. Instead of telling what each is, I would leave it for you people to try out. Finally It rained in Bangalore! I was the few odds to be there. Leaving late from office made me catch some drops. The only urge for you is to get out and get wet in rain. All the week long head was swept away. Don know if it was coincidence, only yesterday I had a chance to go to Gym. :-) Seems it has rained in Hyd too, as blogged by Aarthi here. Bangalore is happening always, happening in many ways. The recent thing thats around coder like me is, "The Power Cuts". I stay in Koramangala. You land up in home tired and find yourself in a dark room. Its worser to be in that situation. Though being a cricket lover, some times I end up knowing whats happening in the Caribbean. Yes, this had been the boring worldcup for the Indian fans. But still cherish the Quality cricket played by Aus, NZL, SA, SL. But I'm following football and F1 upto date. ManU trashed Roma 7-1, Hamilton Heroics in Malaysia. It was a wonderful week to think and cherish! Weeks back we kick started the plans for this so called get-together. Internal mail threads hitting record count. 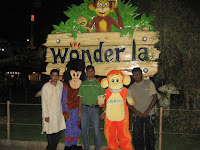 Then finally we all set it the journey to wonderla. It was slow due to morning traffic in Bangalore. But reached the junction in mysore road, where we got to take a diversion to the theme park. The first though that came to most of us when we went there was "look at the crowd". Yes, there was children, family and friends pouring out to enjoy their day. Fares were bit on the high end, but easily affordable for any bangalorean. Adults 540/- and children 400/- on weekends. Once we entered we filled things in locker rooms and set out for Land rides. 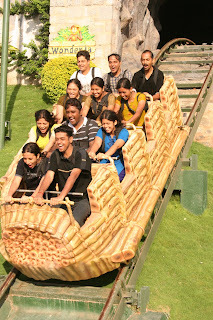 Its a best place for people who love adrenalin rushing fun. 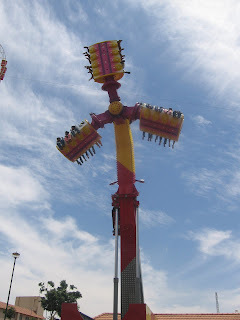 There are rides that can turn you from 0-360 degrees. I enjoyed a few too, if not all. Then for some snacks and lunch by the time it was around 2pm. Lunch seems to be good, point was the place was maintained clean inspite of the floating population in and out of the cafeteria. Then we went for the water rides, Disco rain dance was good, where we had awesome fun. Then water pendulum me and my friend (two heavy weights) had a wonderful run. Then the lazy river, where many cursed me for various reason :). Then the major attraction of them was a water skye, where we splash on water from a high start. The attraction was on the way down, high speed capture our excited descent. Once the ride is over we can get hard/soft copy of the photo. One thing reader, its a pretty crowed place, for every ride you got to stand in the queue for 10-20 min. One person to be credited here was Damodrakannan (aka dams). He was the transportation organizer for the Wonderla trip, it was neat to go and come by cab. Else our life would have been miserable by boarding BMTC. Day 2: It was a hot sunny Sunday morning, where myself and some of my team mates gathered to play a cricket match within Novell (currently interning in this company). Funny part was own team did not even have the minimum number of players to play a match. Some how we gathered others and played. Our opponents won the game due to our poor bowling. Then pit stop was Richmond hotel, bangalore for lunch. Though the place was good, the menu was not attractive. Then a small nap. :) By the evening few of us planned to go to மொழி - tamil film. This is the first time I try something like this in my Scribbling. The film was soft, meaningful and comedy film. The theme chosen there was good. A story about a girl who is deaf and dumb. The first half was loaded with giggles by Prakashraj and Pritivraj. After Azhagiya Theeye or Kanda Naal Mudhal this seems to be again an out of the box theme and low budget hit. Jothika played her part well and also credited by the music. Hence its worth for money!